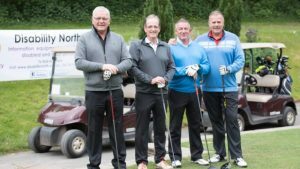 We are delighted to announce that the Disability North Golf Day 2018 wil l take place at Hexham Golf Club on Friday 18th May 2018. The entry fee is £275 for a team of four and you can book your place by e-mailing kevinwright@disabilitynorth.org.uk or by using the PayPal button below. Please book early to avoid disappointment, it would be wonderful to see you this year. Disability North is a free Independent Living Service which provides life-changing support and help to over 8,500 disabled people, older adults and their families in the North East of England and Cumbria each year.